Get notified when Meghan Trainor tickets are available! Meghan Trainor is an American songwriter, singer and record producer out of Nantucket, Massachusetts. 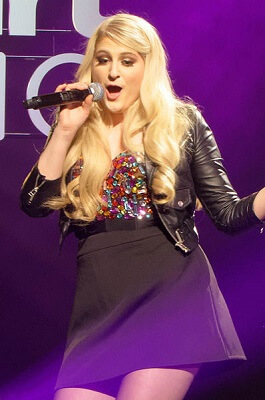 Between the ages of 15 and 17, Meghan Trainor wrote, performed, recorded and produced three of her own albums independently. In 2011, she signed a deal with Big Yellow Dog Music and began to work seriously on her songwriting career. Trainor signed yet another deal in 2014 with Epic Records and released the major-label debut that would propel her into fame with tracks like “All About That Bass,” “Like I’m Gonna Lose You,” and “Lips are Movin’.” The album, Title, rose to No.1 on the Billboard 200. You can see Meghan in a city near you by purchasing Meghan Trainor tickets using the links above.